But first, ‘the best, the most skillful, the most devious and the most cunning of them all’ surprised the nation by calling a general election last Sunday morning. But, contrary to what they’d have you believe, it had nothing whatsoever to do with some silly payment of £30,000 to Celia Larkin in prehistoric times. I can exclusively reveal that the real reason was much more sinister and devious than any of the polcors and hacks have yet to sniff out. Last Saturday evening the inner sanctum of the Garry Miley Planning For All campaign met at my local to finalise strategy in advance of making an official declaration that I was preparing to run in County Clare. After a couple of pints, it became quite obvious that there was no way Bertie would call the election before July 4th, leaving the door open to us to launch a massive media blitz during the month of June (me being away posing with D list showbiz folk working in Los Angeles for most of May). With Fianna Fail reelling in the polls, the idea was to steal 10,000 first prerences in the FF heartland of west Clare. So simple, I wouldn’t even have to break a sweat. It all hinged on the election being called in July. Back from the local and slightly steeped (which is my preferred state when I’m putting together a Dispatch) I quickly composed my official announcement as well as a lengthy and detailed planning manifesto. But just before I hit the ‘Publish’ button (which issues the Dispatch to you lot), I appear to have passed out. 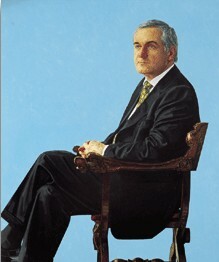 Next thing I know, I’m awake at my computer listening to the news that Bertie had just officially asked the President to dissolve the Dail and call a new election. For late May. It’s clear what happened. Fearful that a late election would give me a chance of pulling a seat they couldn’t afford to lose, Bertie tried to outfox me by opting for May, when he knew I wouldn’t be ready. It was also clear that there was a secret FF plant within my organisation. That leaves only one other possibility. It kills me to think that the man I thought the most honest, the most trustworthy the veritable moral compass for the whole of the province of Munster inself, Mike Maher, had gone and stabbed me in the back. You see, he was on the dry all night recording proceedings on that little Dictaphone of his (has anyone ever had a conversation with Mike that he hasn’t recorded? ), and on the pretext of some exams he said he was studying for (hmm?) left the meeting early. This is what must have happened: before leaving the pub, Mike must have spiked my drink to make sure I wouldn’t be fit enough to get the Dispatch out later that Saturday night. Then he must have called his contacts in the FF organisation alerting them to the fact that the old Sile de Valera seat was MINE if the election was in July. This, of course, must have put the fear of God into Bertie who must have known that whatever it was Mike put in my drink would wear off before half ten Sunday morning. Which is why he had to get to the Phoenix Park by ten. And get this: repeated calls from my organisation to the FF people on Sunday went unanswered. Which can only mean one thing: Bertie called the election because he was afraid to take me on. The battle, Bertie. Not the war.